A few weeks ago, I talked about the Landscaping Project we’ve been working on at Banting House National Historic Site of Canada. I mentioned how we were using old photographs to help determine what vegetation was in place when Sir Frederick Banting lived here from 1920-21. Photographs can be powerful tools to identify features in landscapes or on buildings that were not recorded on paper. Researching the past using photographs requires just as much care as interpreting primary source documents, though, as you can’t be sure that they have not been modified in some way. This became quite clear as we studied the photo of Banting House that was printed in the Detroit Free Press. 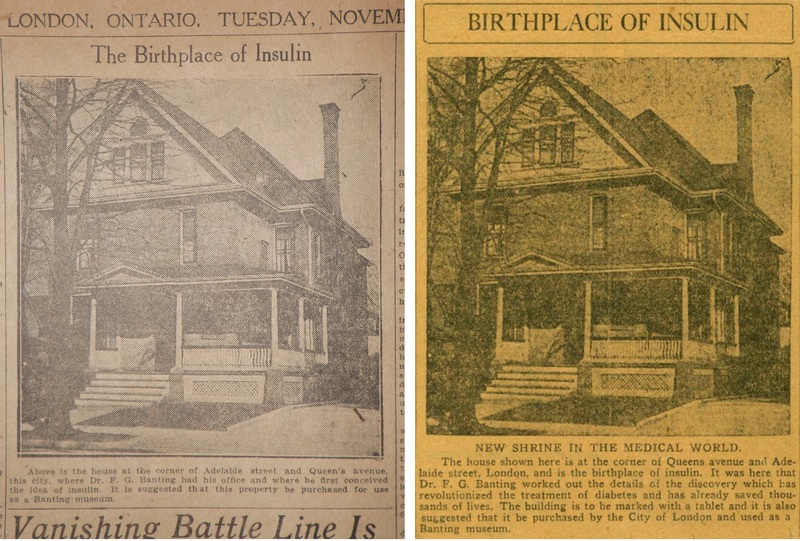 To figure out what Banting would have seen when he walked out of his front door, we started by looking at a photograph the Detroit Free Press ran in 1923. It showed that there was a tree in front of the building that had been taken down by the late 1930s. The image quality made it hard to see exactly what was in the photo and if the tree was located in the boulevard between the curb and sidewalk, or if the sidewalk had been constructed around the tree. Luckily, the photo that the Detroit Free Press used was a reprint of a photo that had appeared in The London Free Press a few days before. The photo in The London Free Press actually shows a wider view of Banting House. Comparing the two images, you can tell that the photo that the Detroit Free Press published was cropped! The photo from The London Free Press let us see that the tree had been planted just inside the curb along the boulevard, which meant the sidewalk had not been poured around the tree. Unfortunately, the image is also somewhat distorted which meant we were unable to determine if there was another plant of some sort in behind the tree on the grass. The photo on the right was published in The London Free Press on November 13, 1923. It shows the curb at the bottom of the image. The photo on the left was published in the Detroit Free Press on December 9, 1923. It shows the tree at the front of the house, but not the curb. Just like when you are using written documents to do research, you have to keep in mind that photos may have been altered in some way – especially if you don’t have access to the original print. In this case, we don’t know who took the original photo or if the photographer took any other pictures of the building from different angles that would have helped determine what had been planted during Banting’s time in London. This is because photos weren’t archived by The London Free Press until the 1930s. Working from the newspaper images also made it harder to analyze the images because the quality wasn’t as high as it would be from an original print. While we don’t always find images that suit our needs exactly (such as finding a number of photos of Banting House from different angles), photos represent a snapshot in time and can help inform present-day projects such as deciding how to landscape a property. We just have to remember that they don’t always show us the whole picture. Next Post Coding at a History Museum?